How can I not give perfect score to this masterpiece? I already heard from a lot of people saying that its gonna be really sad and this and that, but I never known that it is REALLY THAT sad. So grab your tissue before watching. At least a box. The story starts from their first meeting (i suppose the first chapter?) so everyone can watch it even if they have never watched Doraemon before. At first both of them just wanted to finish their own goal, but then It's very sweet how their relationship grows as they spend their time together. The story is pretty straightforward, similar with the Anime, where Nobita is such a failure in life and Doraemon come to rescue with his magic pocket. The main difference is the movie gives more focus about Nobita's struggle in his love life. Something that bug me is that I feel Doraemon is so mean (this is very subjective, however for people who already watch Doraemon's kindness to Nobita in the anime may feel this way too). Doraemon thinks Nobita is hopeless and seem to hates him, but then it changes (pretty suddenly). I think the movie is too short to show all the hardships they've been trough, but still they managed to wrap it all perfectly. The CG is just amazing. Deep. How they develop each character is amazing, especially Nobita. From a fail lazy kid, becoming a brave and responsible young adult. For Doraemon, I still think they need more scene to show how his feelings to Nobita had changed. Overall, this movie is amazing!! i love it~ Sometimes I can't even see what's happening because of my eyes flooded with tears. This may be the final episode of Doraemon, but the other OVAs are still coming so u don't have to feel lonely! As a long time fans of Doraemon i think any opinion or thoughts about this movie will be biased, but that comes with a price, high expectation. Don't have high expectation because this movie doesn't give you any new story, it's just a renewed recaps of Doraemon's best episodes. Won't tell you which ones. The thing is, the pacing is bad. Like cardiac arrest bad. Suddenly it's going so fast, and suddenly it's going so slow when there's part that could be skipped. Stand By Me skipped what's important and extend what's not. That's where the visuals kick in. Bang. I will never feel the same about Take-copter after seeing this movie. It's so mindblowing. Doraemon, Shizuka, and Nobita look cute and adorable. Gouda still the badass he is in the manga, and Suneo is still as annoying. Visuals are the best thing in Stand By Me Doraemon because it gives us a new look, a more updated look that keeps us watching the literally same story from the manga version. If the visual is not enough, there's still the soundtracks and scoring. 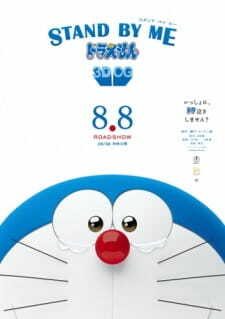 It captures Doraemon's tone perfectly by using acoustic guitar, and using melodramatic piano tone in the perfect timing. Once again, if you don't like the visual, at least you'll like the soundtrack. Or the seiyuu. Kudos on the seiyuu. Some moments won't be as great as it was if they change seiyuu into another seiyuu. Overall, it's a good watch. If you are not a fan, you might love this movie because you (maybe, hopefully) don't know the story. If you are a fan, it's still nice seeing your childhood relived. At the first till almost end, the story is so fine, even it feel like the pace was a bit fast. But, the ending wasn't feel right, I think it will better if it end in 10min earlier than original (I don't want to spoil it), when the most touching moment happens. I think it has Unique art in characters expression, and of course with the scene background. The seiyus are good enough eventough I think it will be better if their adapt more. I like the characters design, especially Adult Shizuka, she was so cute and mature, the rest all the same, they look a like with the series. After all This movie satisfied me after waiting it for so long, as a fan of Doraemon series since I were a kid, I'm glad to saw this one.